This spring has seen a raft of software company events and announcements and they’ve been good meetings full of real news and important new developments. It is as if these companies bided their time during the worst of the recession building new product, thinking about the future and how customers will use their technologies. It was time well spent. 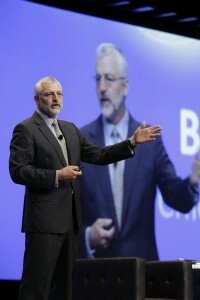 Last week SAP, NetSuite and others have held meetings and more good news seems to be emanating from their conferences. I attended the NetSuite SuiteWorld event in San Francisco and that’s what I want to write about here. For at least two years most ERP vendors have been championing the idea of a two tier ERP strategy. I’ve heard messaging from Microsoft, Oracle, SAP and NetSuite and, plus or minus a few wrinkles, the idea is that conventional ERP built for the late twentieth century is tired. But rather than scrapping the huge investment in blood sweat, toil, tears and a not inconsiderable number of dollars, most companies deploying new ERP will be doing so in ways that surround the original deployments rather than replacing them. That was the story up to last year and it was a good and logical one. Vendors loved it. Two tiers made the old system with its high maintenance charges a fixture for at least another decade while giving everyone a chance at new business. For customers, few thought ERP was broke and even fewer had an appetite for fixing it. But many did have serious needs to fill in what old ERP lacked — the social, mobile, cloud, big data issues that won’t go away. To this you should add commerce, which will bring us current. One of the hidden themes running throughout the software industry today — a theme that no one other than me, I sometimes think, ruminates on — is the high cost of energy required for doing business. Escalating transportation costs factor into the social, mobile, cloud etc. alluded to above as well as what I’m going into next. So back to the present, San Francisco and SuiteWorld. In his keynote today CEO Zach Nelson unveiled a comprehensive approach to ecommerce running off NetSuite’s financials called SuiteCommerce. Now, NetSuite has been offering ecommerce solutions for many years and they already have successful customers running commerce sites (about 2,800) off their financials and integrating other important modules like their warehouse system. The difference today is in emphasis, partners and application development tools from NetSuite that brings everything together in a solution set that aims the company at being a significant player in a new generation of integrated and flexible back to front office systems. Parenthetically, this is how disruptive innovations take root which should provide no comfort to the major ERP players basking in their apparent good luck. In announcing SuiteCommerce, NetSuite has added a third tier to the conventional ERP wisdom. The major difference between two and three tiers is the emphasis on reaching customers through the commerce solution and the recognition that NetSuite, at least, owns two out of three levels. This has big implications for all businesses. As Nelson correctly pointed out, the demand for some of this new commerce approach will not come from you and me but from the devices we use to run our lives. The fridge is out of beer so it signals the store or at least my personal device to remind me to pick some up. The car needs service — already a cliché but nonetheless an important reality — so it negotiates a service appointment. On and on it goes. The Internet of things will be much bigger than the Internet of people and the Internet of things will be a major acquisition portal for business and consumers as well as a major user of automated commerce technologies. Commerce solutions that make it easier for people to buy and receive products through efficient channels is a great first step. Back to transportation costs. The Internet of things will be instrumental at consolidating demand and ensuring that supply arrives in the most efficient way, easing the transport issue all the way up the supply chain. Of course, the Internet of things will also enable actions that have no commerce involvement and it’s important to recognize but not to delve into here. What makes SuiteCommerce appealing is the “something for everyone” approach. NetSuite’s financials can act as a data hub funneling necessary product and pricing data to user interfaces including their own as well as third parties. The financials, shipping and invoicing technologies provide the critical single source of the truth that has become a NetSuite mantra. And powerful tools make it possible for developers and business users to make or modify commerce systems at, well, the speed of business. So there’s a lot to like coming from NetSuite today. Earlier, the company announced revenues of nearly $70 million for the last quarter and the CEO repeated his guidance that the company would generate $300 million in the coming fiscal year. While he was at it, Nelson also announced new partnerships with Grant Thornton, and Deloitte’s sprawling digital business group. So there will be plenty of help on the implementation side, which is most important in the two or three tier approach in dealing with the very large companies that are beginning to flock to NetSuite. I can’t say that three or even two tier solutions were on my radar when I first contemplated SaaS for ERP. Honestly, I thought ERP for the cloud was an exercise in squaring a circle. But it seems like the industry has a plan at last and innovation continues at the margin where NetSuite is carving out quite a position for itself.